Do you have those face breakouts again? Are you annoyed with your blackheads and oily skin? It’s time for a clear-out — have an ultrasonic facial cleansing! Can you say you are always happy with your reflection in the mirror when you get up in the morning? It is not only about age-related changes. You can have an unpleasant surprise such as a pimple at any age and it can really bring you down for a few days. So how can you resist those nuisances? The answer is simple: you should have your skin cleaned regularly. Unfortunately, it is impossible to remove all dead cells from skin, to make it even and eliminate epidermal thickening at home. You cannot do without a professional beautician, especially if you have problem-prone (oily) skin. How can ultrasonic facial cleansing help you? It depends on the condition of your skin. We offer a free consultation at our clinic where a beautician will tell you what type of cleansing suits you best and how often you need to have it done. 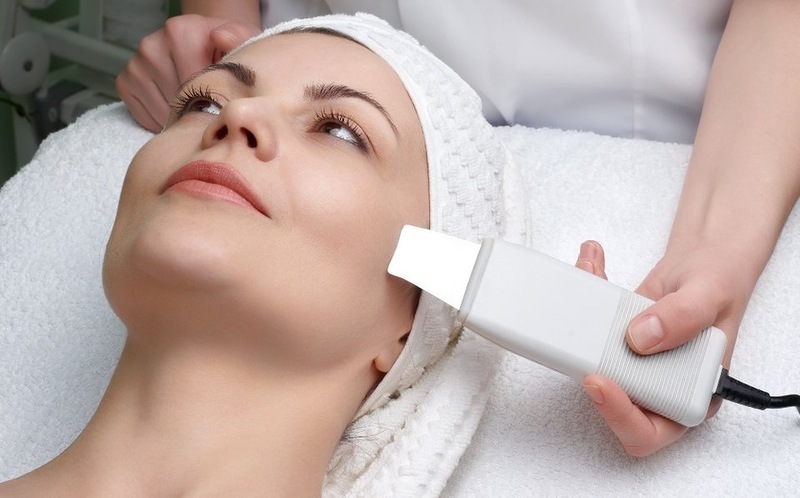 What is special about ultrasonic facial cleansing at our clinic? If you search for “ultrasonic facial cleansing Moscow” online, you may find a lot of salons and clinics that offer this service. But if you read customers’ reviews, you will see that in different places it is performed differently which means the effect is different too. First of all, the doctor will clean your face with specially selected natural oils which will not only remove dirt from the skin but will also have anti-inflammatory and softening effect. After that we will apply special gel to your face which will moisturize your skin and make sebaceous plugs softer. When your skin is ready for the treatment, the doctor will start the ultrasonic cleansing using a special plate. Close attention will be paid to your problematic areas. After ultrasonic cleansing the doctor will provide some additional treatment: micromassage, lymph drainage or phonophoresis. And finally, there is a soothing mask selected for your skin type. Only by skillful beauticians, who have all certificates and diplomas, endorsing their qualification. Using only sterile tools. We take special care to provide sterility of our devices. It is no secret that the consequences of ultrasonic cleansing such as skin rash are caused by beauticians’ negligence. Only after a consultation which is free. Ultrasonic facial cleansing, like any other procedure, has some contraindications. Besides, this method may be unsuitable for you. That is why our doctors always examine patients and give their recommendations before the treatment is started. Click here to see all prices of facial cleansing. Do you want to save money? Order the full course of treatment and get additional 10% off! It should be emphasized once again that you can find a lot of offers of this procedure if you search for “ultrasonic facial cleansing salons” online. But when choosing a salon or clinic try to be guided by the quality of the treatment and beauticians’ expertise, not the price. Ultrasonic facial cleansing is a serious procedure and if you have it done improperly, it may take years to deal with consequences. In this case, you may have your face spoilt in pursuit of seeming economy. You can call us at 8 800 700-72-87 right now to book a free consultation or place a request to know what effect you can expect of ultrasonic facial cleansing.